This contract is for use by a business in any industry, to regulate a deal for design and manufacture of a prototype product. That could be anything from a range of fashion items to a steering system for railway carriages. Suitable for home or abroad. Professionally drawn and very thorough. Specification of work to be attached by you or entered in schedule. It is an umbrella version suitable for either a single instruction, or for multiple or continuing orders. 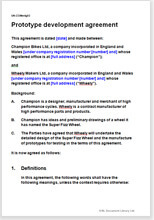 This agreement has been drawn to cover the structure of a complicated deal in simple terms you can edit yourself. This contract is for use by a business in any industry, to regulate a deal for design and manufacture of a prototype product. That could be anything from a range of fashion items to a steering system for railway carriages. Professionally drawn and very thorough. Suitable for home or abroad. Details of work to be attached by you or entered in schedule. It is an umbrella version suitable for either a single instruction, or for multiple or continuing orders. We cannot hope to think up the specification for every possible product. We leave it to you to provide your specification for design, finished product and standards to be achieved along the way. All this will be set up by you and either attached as a separate document or typed up as the schedule. "The document was extremely useful and I shall certainly use your service again."